I was recently invited to join my hunting-friend in a damage control program (or better 'party'? 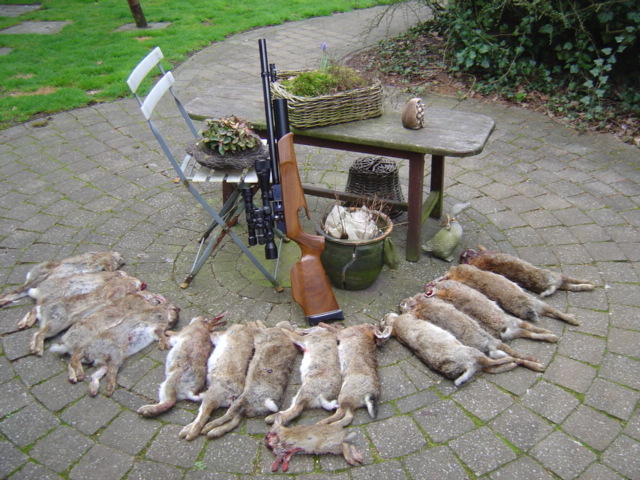 ), to shoot rabbits on a big factory that's not allowed for public entrance. But there are some rules: no dogs allowed and no fire arms allowed. 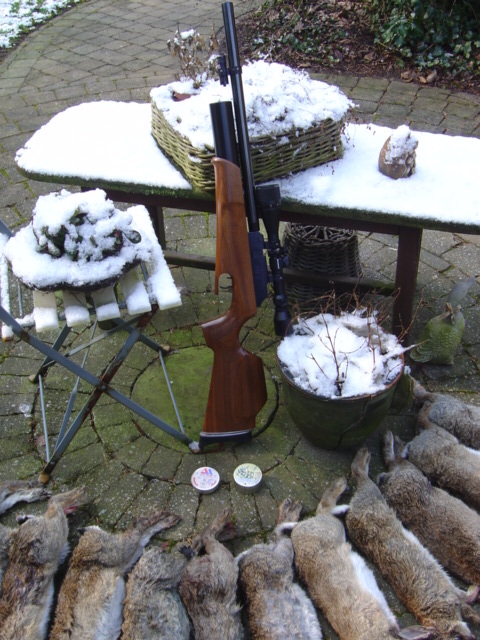 At first they let me shoot a Weihrauch HW90 in .25 and I trained many rabbits, even killed some I think, but only little in the pocket. That airrifle was not my friend: difficult to load, to big to handle inside a car, lot's of recoil and a bullet trajectory like a trown rock. I had decided that a needed a PCP in .22". Till I contacted a friend, who is a member of the belgian FTT (Field Target Team) and he convinced me to go for the flat traject of a .177" airpellet. I was able to shoot 12. So I wanted to introduce you to my new friend Theoben Rapid MFR and I let you chose: I've been told that MFR stands for "Multi Functional Rifle", but I'm allready convinced it just means "Made For Rabbits"
and Geland: when you want a cheap and pleasant way to shoot some wabbits, think about airrifles and when you get the chance for a MFR: don't hesitate! (mine is .177" and only 12 fpe or 16 Joule, but I allready discovered that you better have some aid in hitting what you want to hit than lot's of energy of a .25 that also comes with that more curved traject). 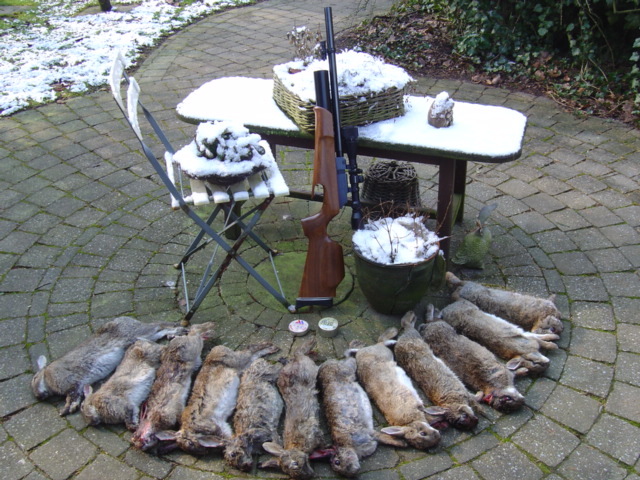 These are some pics to go with Aloys post on hunting rabbits. Aoys big friends...his hunting buddies. 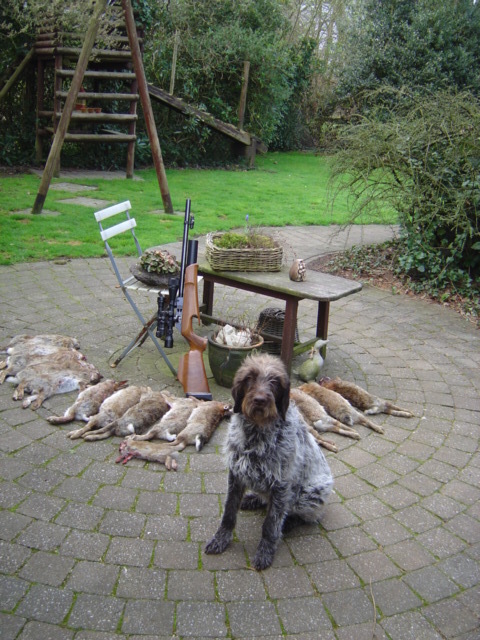 Aloys, congrats on a successful hunt! That is one beautiful air rifle. Wow, more expensive than any AR I've built! But beautiful just the same. @Vince: thanks for your help and I see you also like my czech girlfiends... and don't be mistaken: the small one is the queen, the big one is the servant. Don't you see how hard they are working? SJ, I shouldn't say it, but the experience I have till now make me say they are worth the money. Now I'm waiting for a day without wind to give a little surprise to these crows at 80 m in the trees behind my house. When I can give them a headshot, then I call it a golden rifle and I will be unhappy that I didn't buy such a thing many years ago. Under the barrel (attached) and just in front of the cylinder...What is that? That's a small red laser. Not allowed here on fire arms, but nobody seems to have problems when you put them on toys as airguns... same with lamps, silencers etc. Because we have to go there at times most of the workers are home, it's rather dark and it's very difficult to estimate distances in the dark. Even measuring the distance is not easy because A) you don't have much time and B) very difficult to find your rabbit to point at (and too much light will scare them). And when you're not rich, it helps to be clever (sometimes). So I figured that when I zeroed my optics and the laser at 32 m, the laser being under the barrel and the optics on top, the red spot would appear on the cross at 32 m, under the cross at shorter distances and above the cross when more than 32 m.
Theoretically that should work fine, I even tried to discover where to put my mildots, BUT: during day everything worked the best at multiplication factor 7x and I forgot that turning your variable optics to bigger multiplication also means losing a lot of available light. So I still have to work on this. Maybe I just put a stronger green laser together with my lamp (allready removed at the picture, sorry) and use it next time as extra light. 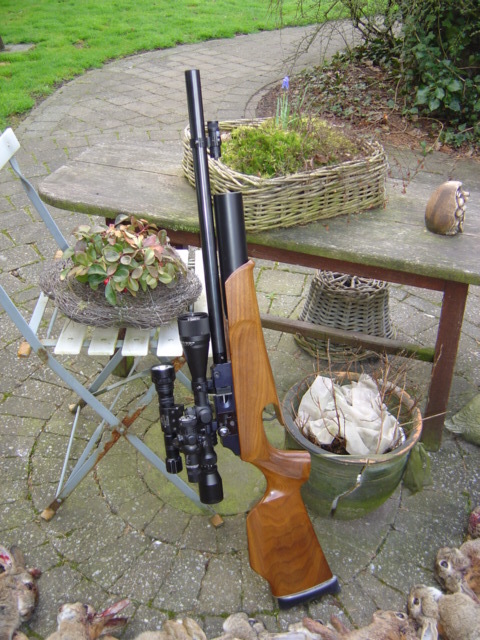 That is one sweet looking air rifle Aloys. that method of rangefinding works at longer range too. eg dot on at 100yrds. nice job getting the bunnies. I dont underestamate a .177 anymore after using a break barrel wairark man that had some oomph!! Yeah aloy, I always wanted an air rifle. But the law here regulated every shooting thing, and that I think include air rifles and water pistols..
Also, the size of my safe dictates that if I am buying another one, then one of the former resident must go..
About skinning, mate, whatever shake your tree.. There are 10001 way to skin a rabbit.. I do it my way, you do it your way.. They still ended up delicious. 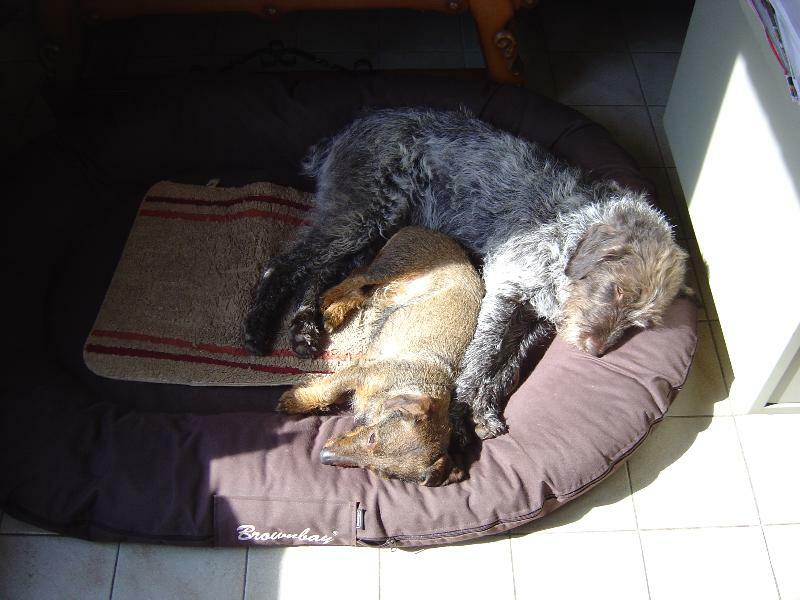 I like your hunting buddies mate, looks like they get a well deserved nap. Well, I can only add that it's really fun and skills are improving. And yesterday we had a lot of wind... already looking forward for a next 'hunt' if possible with no wind that makes live difficult. The last rabbit was shot at about 60 m, knowing that due to the poor light conditions I have to use 4X multiplication factor I think I have to admit that this last shot was pure luck (or bad luck for the rabbit).